Definition - What does Parivrtta Baddha Utkatasana mean? Parivrtta baddha utkatasana is an intermediate twisted asana. The name comes from the Sanskrit, parivrtta, meaning “revolved," baddha, meaning “bound,” utkata meaning “fierce," and asana, meaning "pose." To enter the pose begin standing in tadasana, big toes touching and heels slightly apart. Drop the hips as if sitting on a chair, careful to keep the knees aligned behind the toes. Bring the hands into prayer position in front of the heart. Twisting from the core bring the left elbow on the outside of the right knee, turning the chest to the right. Spread the arms into a “T” with the left fingers touching the ground and the upper arm above the shoulder. From this position, thread the left arm between the thighs while the right arm reaches around the low back to grasp the left wrist. Interlace the fingers and bring the drishti toward the sky. Hold for a cycle of four to six breaths then mindfully release the clasp and come out of the pose. Repeat on the opposite side. Parivrtta baddha utkatasana is known as bound revolved chair pose in English. 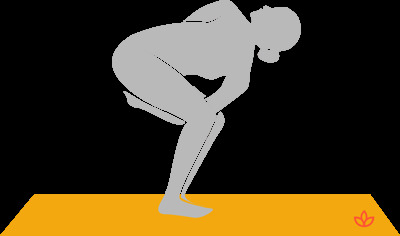 Suggested preparatory poses include garudasana (eagle pose), utkatasana (chair pose), pasasana (noose pose) and parivrtta utkatasana (revolved chair pose). Those with neck pain can keep the drishti forward rather than to the sky.